Who is Gentlemen of Harmony? 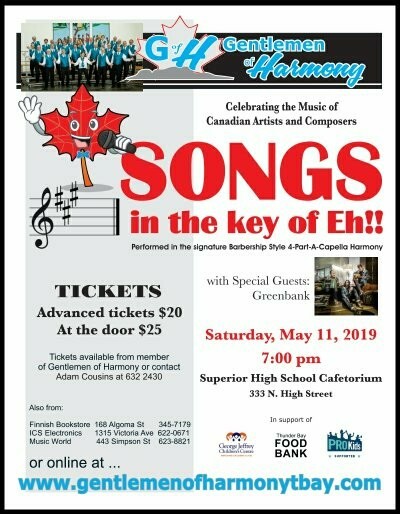 The Gentlemen of Harmony (G of H) is the chorus name of the Thunder Bay, Ontario chapter of the Barbershop Harmony Society, the largest gender inclusive singing organization in the world. The chorus formed in 1972 when a few men interested in singing barbershop four-part harmony got together, organized and chartered a chorus. 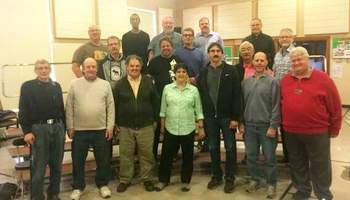 G of H was incorporated as a chapter in the Barbershop Harmony Society – Land O’ Lakes Division, in 1975 and as a not-for-profit corporation in 1999. 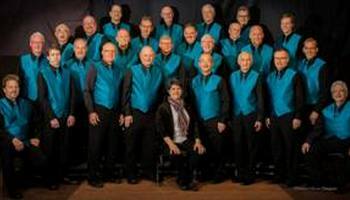 The chorus was originally known as the Northern Notes (also Thunder Bay Barbershop Chorus) until 2009, when they renamed it the Gentlemen of Harmony chorus. We rehearse every Tuesday evening at 7pm, at Superior High School Cafetorium , 333 N High St, Thunder Bay, ON, Canada. Spring Show - Songs in the Key of "EH"
Want Gentlemen of Harmony to sing at your next function? Why not hire Gentlemen of Harmony to entertain at your next event? We can perform at corporate functions, charity events, community Entertainment events, birthday parties, christmas parties, awards nights, weddings, engagements, anniversaries, engagements, and even funerals and memorial services. Gentlemen of Harmony is committed to protecting your personal data and will use any personal or sensitive data we collect from you. In Europe, this is in line with the General Data Protection Regulations (GDPR). Gentlemen of Harmony collects data from individuals to help us plan, organise and run the day-to-day operations of the group (e.g. co-ordinating rehearsals or collecting subscription payments) and to promote and market the group’s activities (e.g. marketing mailing lists and photography/video capture). This data will be used by our admin team to manage your membership with Gentlemen of Harmony and to organise and run our activities. When you sign-up to our marketing mailing list we will ask for your email address and will use this data to send you information about our events and activities (e.g. upcoming events, latest news, etc). We will only send you information that is related to Gentlemen of Harmony. (i.e. we will not use your data to send you marketing messages from 3rd parties). If you purchase an event ticket, or Gentlemen of Harmony merchandise, or make a donation, we need to collect data on the person making the purchase. This data will only be used for administering your booking/purchase/donation, and will not be used to send you marketing/promotional messages from the group. The Gentlemen of Harmony data retention policy is to review all data held on individuals at least every two years and remove data where we no longer have a legitimate reason to keep it.